Revelation, or revealed religion, is defined in Webster's New World Dictionary as: "God's disclosure to man of Himself." This should read, "God's alleged disclosure to man of himself." For unless God reveals to each of us individually that a particular religion is truly His disclosure to us of Himself, then, by believing that religion, we are not taking His word for it, but we are instead putting our belief in the person or institution telling us it is so. This is what we are doing when we believe in any revealed religion, and that's all Christianity is. It's a revealed religion like many others such as Islam and Judaism. Revealed religion gets dangerous however, when it crosses over the line into politics. This is the admitted goal of the Christian Coalition. God allegedly revealed to Pat Robertson and his Coalition, that He wants them to take over America and eventually the world with "His Word," so the laws of the nations will mirror the laws in the Bible, which, if you know what's in the Bible, is terrifying. This, too, is what the Ayatollah's goal was, only his "revealed word of God" was the Koran, an other revelation. Are we to believe Pat when he says the Bible is revelation of God's Word? As THINK! has already offered several examples in the above article, YANKING THE TEETH FROM THE RELIGIOUS RIGHT, taken directly from the Bible itself to prove itself false and NOT the Word of God, reason alone will now be used to demonstrate Christianity is NOT revelation from God. "The Calvinist, who damns children of a span long to hell to burn forever for the glory of God (and this is called Christianity), and the Universalist who preaches that all shall be saved and none shall be damned (and this also is called Christianity), boasts alike of their holy [reveled] religion and their Christian faith. "Something more therefore is necessary than mere cry and wholesale assertion, and that something is TRUTH; and as inquiry is the road to truth, he that is opposed to inquiry is not a friend to truth. "The God of truth is not the God of fable; when, therefore, any book is introduced into the world as the Word of God, and made a groundwork for religion, it ought to be scrutinized more than other books to see if it bear evidence of being what it is called. Our reverence to God demands that we do this, lest we ascribe to God what is not His, and our duty to ourselves demands it lest we take fable for fact, and rest our hope of salvation on a false foundation. "It is not our calling a book holy that makes it so, any more than our calling a religion holy that entitles it to the name. Inquiry therefore is necessary in order to arrive at truth. But inquiry must have some principle to proceed on, some standard to judge by, superior to human authority. "When we survey the works of creation, the revolutions of the planetary system, and the whole economy of what is called nature, which is no other than the laws the Creator has prescribed to matter, we see unerring order and universal harmony reigning throughout the whole. No one part contradicts another. 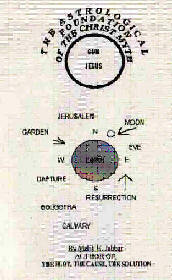 The sun does not run against the moon, nor the moon against the sun, nor the planets against each other. Everything keeps its appointed time and place. "This harmony in the works of God is so obvious, that the farmer of the field, though he cannot calculate eclipses, is as sensible of it as the philosophical astronomer. He sees the God of order in every part of the visible universe." "Here, then, is the standard to which everything must be brought that pretends to be the work or Word of God, and by this standard it must be judged, independently of anything and everything that man can say or do. His opinion is like a feather in the scale compared with the standard that God Himself has set up." Since we know we did not create the creation or ourselves, yet we and the creation do exist, it is logical to believe that God, or an Eternal Cause or Creator created us. This belief has absolutely nothing to do with revealed religion. In fact, all the absurdities of revealed religion are responsible for many sincere thinking people to reject and close their minds to natural religion/Deism. The priests, ministers, and rabbis need to suppress, or at least complicate, the pure and simple belief and realization of Deism for their own job security. And the power elites have no use for Deism because they can't use Deism to "inspire" mankind to wage war against itself for the elitists' own selfish purposes. In fact, Deism, by focusing on the first creed of all religions, belief in God, could frustrate the war/money machine permanently. "I hold (without appeal to revelation) that when we take a view of the universe, in its parts, general or particular, it is impossible for the human mind not to perceive and feel a conviction of design, consummate skill, and indefinite power in every atom of its composition. The movements of the heavenly bodies, so exactly held in their course by the balance of centrifugal and centripetal forces; the structure of the Earth itself, with its distribution of lands, waters and atmosphere; animal and vegetable bodies, examined in all their minutest particles; insects, mere atoms of life, yet as perfectly organized as man or mammoth; the mineral substances, their generation and uses, it is impossible, I say, for the human mind not to believe, that there is in all this, design, cause and effect, up to an ultimate cause, a Fabricator of all things from matter and motion, their Preserver and Regulator, while permitted to exist in their present forms, and their regeneration into new and other forms. We see, too, evident proofs of the necessity of a superintending power, to maintain the universe in its course and order." Because Deism is based on nature, the laws of nature, and the creation, it is a natural religion as opposed to revealed or man-made artificial religion. "In the first place, admitting matter to have properties, as we see it has, the question still remains, how came matter by those properties? To this they will answer, that matter possessed those properties eternally. This is not solution, but assertion; and to deny it is as impossible of proof as to assert it. "It is then necessary to go further; and therefore I say - if there exist a circumstance that is not a property of matter, and without which the universe, or to speak in a limited degree, the solar system composed of planets and a sun, could not exist a moment, all the arguments of atheism, drawn from properties of matter, and applied to account for the universe, will be overthrown, and the existence of a superior cause, or that which man calls God, becomes discoverable, as is before said, by natural philosophy. "I go now to show that such a circumstance exists, and what it is. "The universe is composed of matter, and, as a system, is sustained by motion. Motion is not a property of matter, and without this motion, the solar system could not exist. Were motion a property of matter, that undiscovered and undiscoverable thing called perpetual motion would establish itself. "It is because motion is not a property of matter, that perpetual motion is an impossibility in the hand of every being but that of the Creator of motion. When the pretenders to atheism can produce perpetual motion, and not till then, they may expect to be credited. "The natural state of matter, as to place, is a state of rest. Motion, or change of place, is the effect of an external cause acting upon matter. As to that faculty of matter that is called gravitation, it is the influence which two or more bodies have reciprocally on each other to unite and be at rest. Everything which has hitherto been discovered, with respect to the motion of the planets in the system, relates only to the laws by which motion acts, and not to the cause of motion. "Gravitation, so far from being the cause of motion to the planets that compose the solar system, would be the destruction of the solar system, were revolutionary motion to cease; for as the action of spinning upholds a top, the revolutionary motion upholds the planets in their orbits, and prevents them from gravitating and forming one mass with the sun. In one sense of the word, philosophy knows, and atheism says, that matter is in perpetual motion. "But the motion here meant refers to the state of matter, and that only on the surface of the Earth. It is either decomposition, which is continually destroying the form of bodies of matter, or recomposition, which renews that matter in the same or another form, as the decomposition of animal or vegetable substances enters into the composition of other bodies. "But the motion that upholds the solar system, is of an entirely different kind, and is not a property of matter. It operates also to an entirely different effect. It operates to perpetual preservation, and to prevent any change in the state of the system. "Giving then to matter all the properties which philosophy knows it has, or all that atheism ascribes to it, and can prove, and even supposing matter to be eternal, it will not account for the system of the universe, or of the solar system, because it will not account for motion, and it is motion that preserves it. "When, therefore, we discover a circumstance of such immense importance, that without it the universe could not exist, and for which neither matter, nor any nor all the properties can account, we are by necessity forced into the rational conformable belief of the existence of a cause superior to matter, and that cause man calls GOD. "As to that which is called nature, it is no other than the laws by which motion and action of every kind, with respect to unintelligible matter, are regulated. And when we speak of looking through nature up to nature's God, we speak philosophically the same rational language as when we speak of looking through human laws up to the power that ordained them. "God is the power of first cause, nature is the law, and matter is the subject acted upon." In addition to motion acting as a perpetual preserver, it also acts as a continual source for the universe's constant expansion. Every second the universe is expanding at the speed of light (186,282 miles per second). According to Astronomy Magazine, 2/14/92, page 49, "Astronomers presently believe there isn't enough mass in the universe, even with dark matter, to stop its expansion." This exciting realization should fill everyone with unlimited appreciation when we realize we are a part of this amazing and spectacular universe! The Creator is immeasurably generous! In ATHEISM - THE CASE AGAINST GOD, the author writes, " . . .when I claim not to believe in a god, I mean that I do not believe in anything "above" or "beyond" the natural, knowable universe." Deism teaches that the Creator is knowable and discoverable through the creation itself. It is very understandable how people could be turned off by man-made religions and superstitions with their bombings and financial beg-a-thons, and confuse artificial or revealed religion with God. However, the atheist attitude of accepting things simply as not knowable is dangerous to the progress of humanity. Many things were not knowable in the past that are knowable today. At one time Europeans believed it was impossible to know what was on the other side of the Atlantic Ocean: but they were wrong. As we learn more about the sciences, we are learning more about the Power that put those principles in place. An eternal Being, as Thomas Paine said, "whose power is equal to His will." Revealed religions all teach different opinions on death. Even the different denominations of the same umbrella religion preach different dogmas. A good example is Christianity. Some of the Christian denominations say an essential qualification to get into heaven (of course they all agree dying is a key requirement) is that you have to be baptized "by submersion," while others say just a "sprinkling" is fine. Which is it? Sprinkling or submersion?? The fear of death is a big motivator for many people to support a particular religion. We all know, without the possibility of doubt, that a day will come for absolutely all of us when we will die. This realization brings fear to many people. It also brings money to religious charlatans who aren't ashamed to prey on this fear. In fact, it can be truthfully said that the revealed religions of the world all use the fear of death to put cash in their own pockets. Contrary to this self-serving attitude of the revealed religions, Deism teaches that no one knows for certain what happens after death, if anything at all. It teaches that, based on the creation we are all a part of, we shouldn't worry about it. That instead, we should be concerned for the present and future of planet Earth and humanity. That we should work hard to improve life and also enjoy it here and now. Why should we worry about death when we have so much to do in life? And do we think so little of Nature's God that we don't trust Him with our future? Ethan Allen, a Deist from America's Revolutionary War era, wrote, "Ungrateful and foolish it must be for rational beings in the possession of existence, and surrounded with a kind and almighty Providence, to distrust the author thereof concerning their futurity, because they cannot comprehend the mode or manner of their succeeding and progressive existence." Another Deist that had interesting thoughts on death was Benjamin Franklin. One quote of Franklin's was, "Take courage mortal, death cannot banish you from the universe." Ben Franklin's epitaph on himself provides a look at his belief that our life on earth is not the beginning and end of a personality. He, like Ethan Allen above, seems to have believed that the state of our spirits or souls is of an evolutionary nature. Franklin's epitaph reads, "The body of Benjamin Franklin, printer, like the cover of an old book, its contents torn out and stripped of its lettering and gilding, lies here, food for worms. But the work shall not be lost; for it will, as he believed, appear once more in a new and more elegant edition, revised and corrected by the Author." In Thomas Paine's the AGE OF REASON, we read on pages 177 and 178 the following: "But all other arguments apart, the consciousness of existence is the only conceivable idea we have of another life, and the continuance of that consciousness is immortality. The consciousness of existence, of the knowing that we exist, is not necessarily confined to the same form, nor to the same matter, even in this life. "We have not in all cases the same form, nor in any case the same matter that composed our bodies twenty or thirty years ago; and yet we are conscious of being the same persons. . .
"That the consciousness of existence is not dependent on the same form or the same matter is demonstrated to our senses in the works of the creation, as far as our senses are capable of receiving that demonstration. A very numerous part of the animal creation preaches to us, far better than Paul, the belief of a life hereafter. Their little life resembles an Earth and a heaven - a present and a future state, and comprises, if it may be so expressed, immortality in miniature. "The most beautiful parts of the creation to our eye are the winged insects, and they are not so originally. They acquire that form and that inimitable brilliancy by progressive changes. The slow and creeping caterpillar-worm of today passes in a few days to a torpid figure and a state resembling death; and in the next change comes forth in all the miniature magnificence of life, a splendid butterfly." "I consider myself in the hands of my Creator, and that he will dispose of me after this life consistently with His justice and goodness. I leave all these matters to Him, as my Creator and friend, and I hold it to be presumption in man to make an article of faith as to what the Creator will do with us hereafter."